Why does Paul’s conversion matter to you? That’s the question I’m asking myself today, as the Catholic Church celebrates this amazing saint’s conversion. 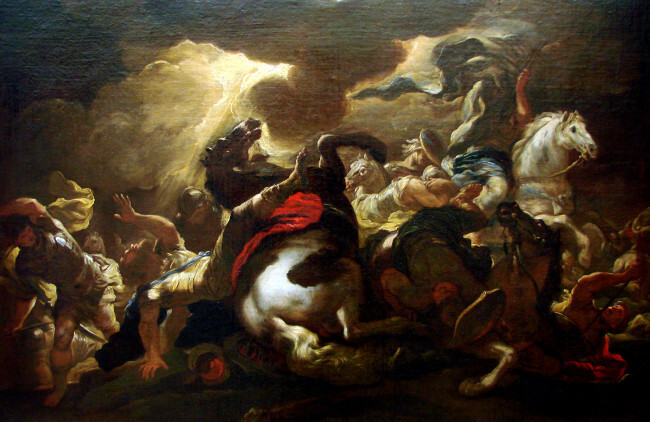 Paul was traveling to Damascus, on his way to kill more Christians, when Jesus appeared to him and literally knocked him off his high horse. In this little scene, there are three details worth noting, and certainly worth meditating upon. Paul asks, “Who are you, sir?” Of course, Paul is wondering who was talking to him, especially since he couldn’t see the person speaking and his companions couldn’t hear the voice. But we should be asking the same question. Who are you, sir? Who is Jesus to me? What kind of relationship do I have with him? Only Paul hears the voice. That’s because the voice was meant only for him, just as the voice we each hear is meant only for us. When our Lord speaks to me in the depths of my soul, he speaks in a manner that is meant solely for me, and which only I will be able to understand. It’s as if he made up a brand new language just for me. That voice isn’t meant for anyone else, so they won’t be able to hear it. Paul was led by hand by his companions. While the voice is meant just for me, the journey is not. We all are part of the Body of Christ, and for that reason are linked together. What one does affects the others, and what the others do affects the one. We are communal beings, and we need each other. I can’t make it along my faith journey without companions – family, friends, spiritual advisors, my parish, the Church at large – to take my hand from time to time and lead me to the next stop in my journey. I love the story of Paul’s conversion for its dramatic and historical aspects. But I also love it for its faith aspects and the message it bears for all Christians. Every single day, we need to ask ourselves, “Who is Jesus to me?” Every single day, we need to clear out the noise in our heads and hearts and listen to the pure, sweet voice of our Savior, renewing, our relationship with him. And, every single day, we need to put aside our pride and allow trustworthy, godly companions to take our hand and help us along on the next stop in our journey.